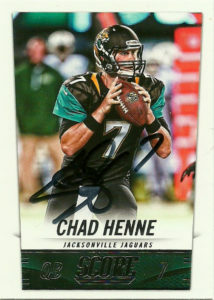 Chad Henne is an absolutely underrated quarterback. Whenever he takes the field in place of Blake Bortles for the Jaguars against the Texans, I get very nervous. He frequently will just take off and run for 4-7 yards instead of trying for a low percentage completion. After Chad built an impressive resume at Michigan as a 4 year starter, he was selected in the second round of the 2008 draft by the Miami Dolphins. The heir to the throne of Chad Pennington, he played sparingly his rookie year, appearing in 3 games in mop up duty. 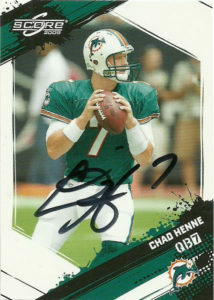 Chad took over the gig full time in 2009 (after a shoulder injury to Pennington) and in 14 starts, compiled a 7-6 record as a starter, throwing for almost 2900 yards and 12 TDs. He again returned as starter in 2010, completing 301 of 490 attempts with 15 TDs. Chad could not hold onto the starting quarterback job in 2011, fighting Matt Moore the entire season. The Jaguars decided to start over again at the quarterback position in 2014, selecting Blake Bortles in the 1st round of the NFL Draft. Chad’s playing time has decreased significantly since then. 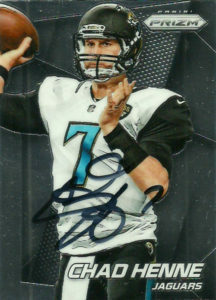 He saw action in 3 games in 2014, but was quickly supplanted by Bortles as the starting quarterback. Since then Blake has been almost impervious to harm, so Chad has not been on the field at all. He’s restructured his contract twice to help out the Jaguars salary cap. Henne is a veteran now and has seen his way around many defenses in the past. He may not have the best TD to INT ratio, but I sense there is still some tools there that some quarterback guru could groom. In 2017 with a new coaching staff in place and a new GM in Tom Coughlin that had no ties to Bortles whatsoever- it’s clearly obvious that the franchise has become impatient with Blake. They’ve put him on a short leash with Henne waiting to start in the wings.